According to the C-ITS Platform initiated by the European Commission, “cooperative Intelligent Transport Systems (C-ITS) use technologies that allow road vehicles to communicate with other vehicles, with traffic signals and roadside infrastructure as well as with other road users. The systems are also known as vehicle-to-vehicle communications, or vehicle-to-infrastructure communications.” (C-ITS Platform Final Report) In summary, the wireless data exchange between the different actors and ITS stations is named V2X communication. It supports a number of information, warning and assistance services which will be gradually deployed in different innovations phases in the oncoming years. The CAR 2 CAR Communication Consortium members build their C-ITS deployment plans on short range communications via Vehicular Ad-hoc Network in the 5.9 GHz band, using the European and US market standards ETSI ITS-G5 and IEEE 802.11p. In comparison with other communication technologies, ITS-G5 displays some features well designed for safety-related applications: Locally self-organising ad-hoc networks, free data transmission, robustness, independence of third party commercial decisions and of communication networks, a. o. 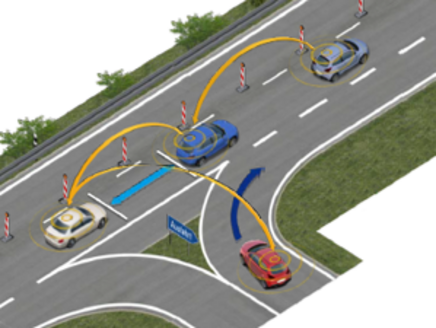 In a cooperative road traffic scenario, communication units are implemented in vehicles and traffic infrastructure, and exchange data with each other via Vehicular Ad-hoc Network. Multiple times per second, on-board units in the vehicles communicate data such as their position, speed and driving direction. Additionally, they send out messages about special incidents, such as an emergency brake or a vehicle defect. So-called roadside units in the traffic infrastructure inform e. g. about phases of traffic lights, speed limits or road works. Thanks to the efforts of the C2C-CC, the formats of these messages are standardised so that vehicles of different manufacturers and across borders are able to communicate with each other. To ensure the privacy of the road users, the messages are anonymized by pseudonyms changing regularly. 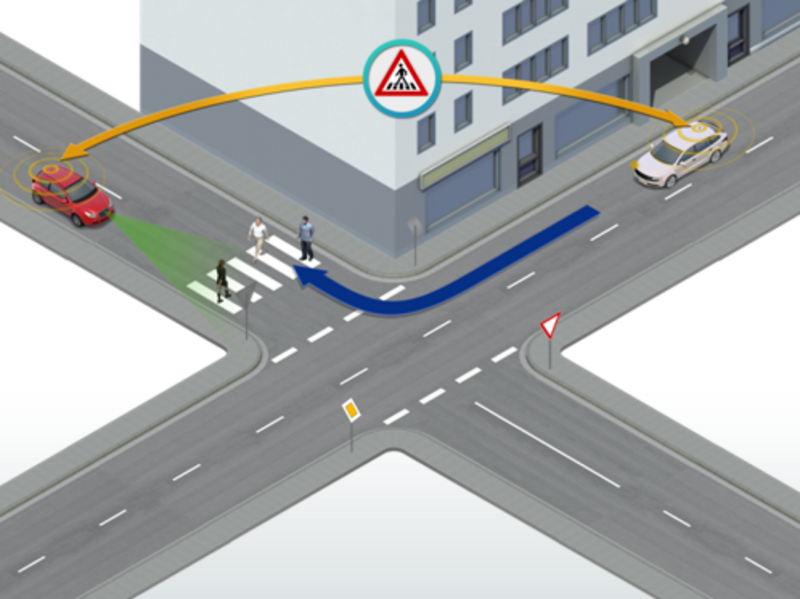 Cooperative systems analyse the data and warn the driver against dangers, e.g. if they approach the end of a traffic jam or a construction site, if a car in front suddenly brakes hardly. This way, cooperative systems support foresighted driving, display dangers not even visible to the driver, and help to avoid accidents. For the driver, the data exchange remains completely unnoticed until a danger threatens. Services such as providing information about traffic light signal phases or barriers on the route help to smooth the traffic flow, linked to improvements in traffic efficiency and driving comfort. Thanks to the work of the CAR 2 CAR Communication Consortium e. g. on open European standards for V2X communication, on specifications, testing and validation procedures as well as the security concept, the V2X communication basic system is mature. The deployment will proceed in different innovation phases, starting with a basic set of information and warning services supported even at low rates of C-ITS capable road users at the time of market introduction. The innovation phases are outlined in the C2C-CC’s services and use case roadmap. The exchange of status data via V2X communication, e. g. the position, speed, driving direction or special incidents like a vehicle defect, enables a set of information and warning services. They support road users in driving with foresight and get aware of potential risks which are not yet visible to them. On top of status data, C-ITS capable road users can share observations gained by sensors, and advanced environmental information. This way, other traffic participants are not only warned against dangers they cannot perceive themselves yet; Also non-communicating road users are taken into account and protected in different traffic situations. 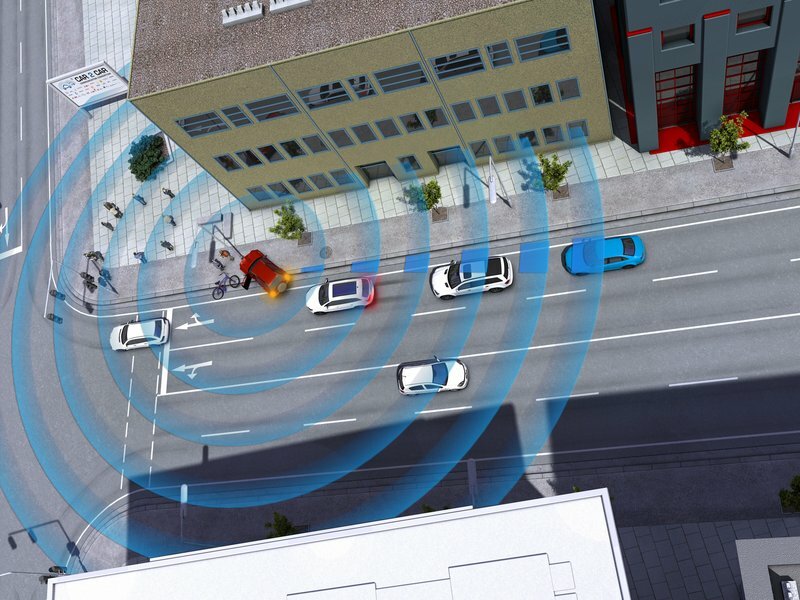 In addition to status and sensor data, cooperative road users can also provide intention data, allowing them to interact intelligently and to coordinate their behaviour even in complex traffic situations. The prediction of is an important requirement for the long-term goal of highly automated and autonomous driving. As off 2019, European vehicle manufacturers will equip the first vehicle models with wireless vehicle communications technology based on Vehicular Ad-hoc Network. Already today, corridor projects and pilots form the first examples of real C-ITS deployment in Europe. Test fields are arising in different countries, pointedly equipping traffic infrastructure with ITS stations and proving C-ITS services under real traffic conditions with assistance of V2X capable vehicles fleets. Initiatives such as C-ROADS focus on the cross-border interoperability of systems and services across different countries, functional or regional hot spots. Such initiatives follow-up on large scale field operational tests and R&D projects which during the past decades have proven the technical feasibility of C-ITS and the benefits of V2X communication to traffic safety, efficiency and driving comfort. The Amsterdam Group is a non-formal, strategic alliance of the CAR 2 CAR Communication Consortium, POLIS, ASECAP and CEDR. These umbrella organisations work together to foster the joint European-wide deployment of c-ITS involving V2V and V2I communications. The C-ITS Deployment Platform has been initiated by the European Commission in 2014 with the goal of developing a shared vision on the interoperable deployment of C-ITS across Europe. Assisted by experts from the Commission, Members States, local and regional authorities, and private stakeholders such as vehicle manufacturers, service providers, road operators, telecom companies and suppliers, the platform discussed technical and legal issues to ensure interoperability of C-ITS across borders and along the whole value chain. Furthermore, most likely and suitable deployment scenarios have been identified. The work of the C-ITS Deployment Platform has proceeded in two phases (2014 - 2016 and 2016 – 2017), and resulted in the European Strategy on Cooperative Intelligent Transport Systems, a milestone towards cooperative, connected and automated mobility. The C-Roads Platform is a joint initiative of European Member States and road operators for testing and implementing C-ITS services with regard to cross-border interoperability and harmonisation of systems and services. The Platform works on harmonised specifications, links the national C-ROADS pilots, supports transnational testing, and conducts specific working groups on subjects such as organisational aspects, technical aspects and evaluation/assessment. National C-ROADS pilots in Austria, Belgium, Czech Republic, Denmark, Finland, France, Germany, Hungary, Italy, Netherlands, Norway, Portugal, Spain, Slovenia, Sweden, United Kingdom trial Day One cooperative services in a real traffic environment. The pilots contribute their implementation framework and experiences to the C-Roads Platform. In the European Cooperative ITS Corridor project, authorities from Germany, the Netherlands and Austria are together with the automotive industry working on the deployment of Cooperative (V2X) Systems. Along the motorway corridor from Rotterdam Frankfurt/Main to Vienna, two cooperative Day 1 ITS applications are introduced, Road Work Warning and Vehicle Data for improved traffic management. ECo-AT (European Corridor – Austrian Testbed for Cooperative Systems) is the Austrian project to create harmonised and standardised cooperative ITS applications jointly with partners in Germany and the Netherlands. The major goal is to finalise technical and organisational harmonisation between industry partners and road operators before deploying C-ITS based services. The project ECo-AT consists of 2 phases: in the first phase cooperative services and systems have been specified and the solutions have been tested by industry, cities and road operators within the framework of a "Living-Lab". In the second phase of ECo-AT cooperative services and systems are realised by deploying them within the framework of a live operation. InterCor is a European project which aims to connect the C-ITS corridor initiatives of the Netherlands C-ITS Corridor, the French corridor defined in the SCOOP@F project, and the United Kingdom and Belgian C-ITS initiatives. 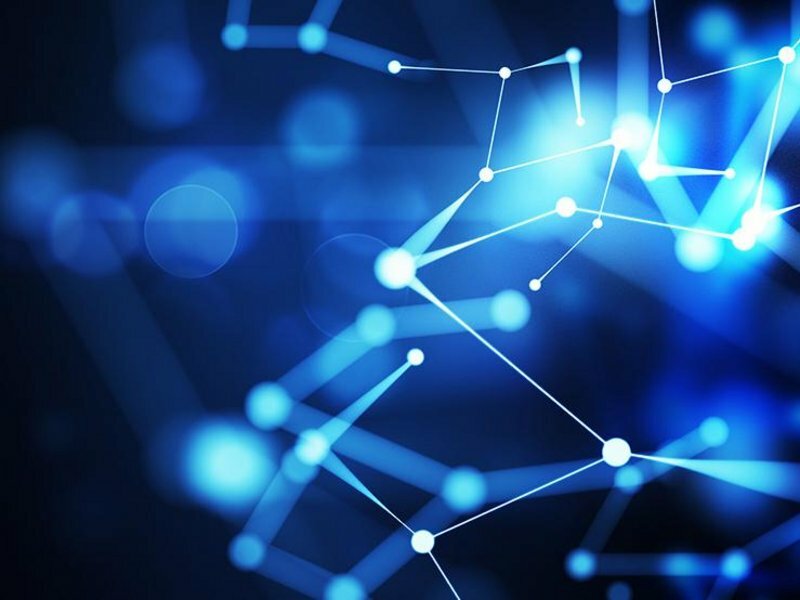 The InterCor project plans to achieve a sustainable network of C-ITS corridors providing continuity and serving as a TestBed for Day-One C-ITS service development and beyond. SCOOP@F is a Cooperative ITS pilot deployment project that intends to connect approximately 3.000 vehicles with 2.000 kilometres of roads. It consists of 5 specific sites with different types of roads: Ile-de-France, "East Corridor" between Paris and Strasbourg, Brittany, Bordeaux and Isère. SCOOP@F Part 2, ongoing since January 2016, includes the validations of C-ITS services in open roads, cross border tests with other EU Member States (Spain, Portugal and Austria) and development of a hybrid communication solution (3G-4G/ITS G5). The CAR 2 CAR Communication Consortium provides a Public Key Infrastructure (PKI) ready-to-use by active CAR 2 CAR members. This Pilot-PKI provides digital certificates for vehicles as a necessary component of V2V communication systems.